Please show your support for Hellenic College Holy Cross this year by making a gift of any size on Giving Tuesday, a global day dedicated to giving back. 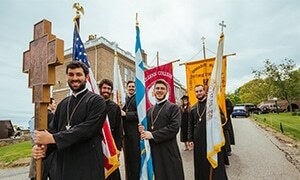 Your generosity has a direct impact on the education and spiritual formation of our students, the men and women who will become the future clergy and lay leaders of the Orthodox Church. Give online at www.hchc.edu/donate.